Tuesday • May 6 • 2014 Volume 81 • Number 18 INSIDE: Presorted Standard US Postage Paid Permit #8 ECRWSS Vermillion, SD Menards n Bomgaars n Fred Haar n Sears n VHS Grad Tab n Steamway n Campbells n bp Broadcaster Press Postal Patron Local Since 1934 201 W. Cherry n Vermillion, SD 57069 n Phone: 605-624-4429 n Fax: 605-624-2696 n www.broadcasteronline.com SALES & SERVICE ON ALL MAKES AND MODELS OF LINE SHAFT TURBINES AND SUBMERSIBLE PUMPS Specializing in Irrigation Well Pump Service Quality Well Service LLC We’ll Save You More Than Just a Drop in the Bucket! 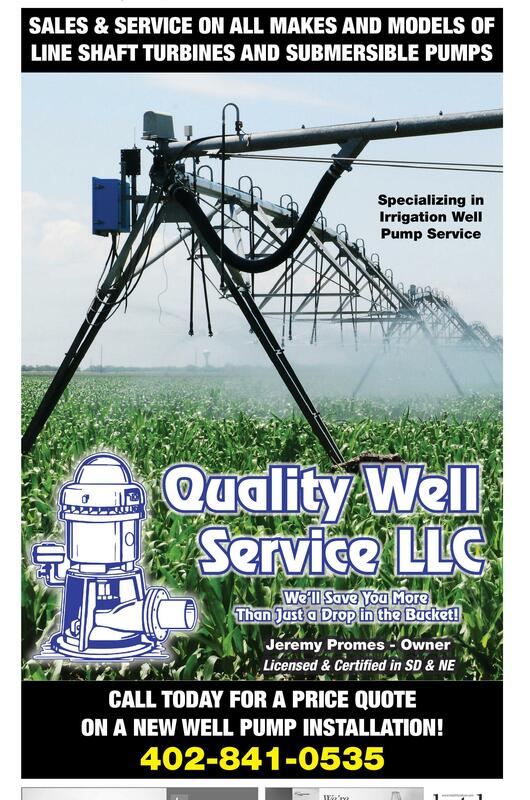 Jeremy Promes - Owner Licensed & Certi?ed in SD & NE CALL TODAY FOR A PRICE QUOTE ON A NEW WELL PUMP INSTALLATION! 402-841-0535 See what’s brewing on the job market. Help Wanted Section We’re making progress on our remodel! www.hatchfurniture.com FURNITURE &MATTRESS 109 East Third, Yankton 605-665-4416 • 800-798-4663 M-F 10-6, Sat. 10-5, Evenings by Appointment We’re remodeling our entire store with the experience of a world famous designer. Come in now for 50% and more off furniture and accessories.